We offer a large selection of women's and men's tees for sale along with collared shirts that are attractive and high quality. Short sleeve, long sleeve, and plus size designs along with adult and youth sizes are available for your review. 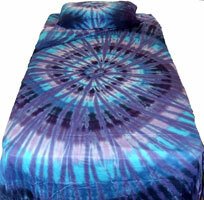 Your search for where to buy tie-dyed clothing, and sheets has now found the number one online store. From rainbow to pastel, you can find the unique pattern to meet your needs. Our tie dye styles include the always popular spiral pattern, crinkles, peace signs, and unique designs (sometimes known as symbols). We recognize how challenging life can be to find the right fit, so we offer adult regular and plus size tie dye shirts small to 6X and cute items for boys and girls. 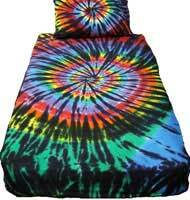 Pullover tie dye hoodies, zipper hoodies, and tie dye sweatshirts are on our shelves and awaiting your purchase. A great selection is available for all season wear. Most outerwear items are available in adult small to 3X. Keeping bedding up to date is always challenging, so we offer high quality tie dye sheets, tie dye bedding, pillow cases, and tie dye duvets for your home. Beautiful bedding is available for any bedroom and dorm room. Sizes range from twin to California king. Why Choose Us Over All the Other Stores? For over 14 years our store has been known for our consistent products and extensive collection of hand dyed tie dye tshirts, dresses, skirts, clothing, hoodies, and sheets. Thousands of individuals, families, teams and kids going to summer camp have been satisfied with our tie dye patterns and quality. Our wide vintage product line includes t shirts, golf shirts, dresses, baby and toddler clothing, sweatshirts, socks, bags, grateful dead shirts, ladies tops, bandanas, tapestries, hats, aprons, bedding, and accessory items. Our colors are almost unlimited including purple, green, blue, pink, red, yellow, black, white, and orange. Our brand is recognized throughout the country for great quality along with personal customer service. We recognize that the Tie Dyed Shop is just one place of many stores you can shop. Being a small business we try a bit harder though to make each order a success. Your success is our livelihood. The company is very proud of our product lines. We take extra care in processing your orders. We also use quality white goods and shirt dyes to produce better products and brighter shirt coloring. With each purchase you will see the difference our happy customers have already found. Visit each section. If you have questions, please email or call us. Tie dye techniques were developed thousands of years ago in Asia. While the science has changed with modern tie dye instructions, dyes, steps in video, and advanced fabric, the basic craft is still the same. Fabric in tied in intricate ways and the dye is poured on. 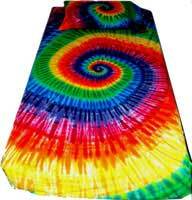 Sounds so easy, but to create out tie dye designs requires a very high skill level and years of practice. We use the best tie dye colors to create the unique designs within this site. We stand apart with the items we sell as we are working for you. To top it off we even offer plus sizes such as 2x 3x 4x 5x 6x in selected shirts. I have ordered from you 4 times... and I have been very pleased with what I received. Whenever I think of tie dye clothing I will remember you. Thank you for everything. Love the tie dye clothes. I have ordered t-shirts from you for a long time now. Just wanted to let you know I have always been happy with your service and quality. Thanks for the wonderful service you have provided and don't change your quality EVER. We just received our order of the pink tie dye hoodies and my players absolutely love them ! The Tie Dyed Shop is a nationally recognized online tie dye company offering high quality brands that fit all age groups and all shapes. We are accredited by the Better Business Bureau (BBB) with an A rating. We sell clothing and accessories that fit men, women, kids, and even toddlers. Our products will surprise you with the bright colors and crisp lines. A collection of some of our most popular tie dye designs is presented below. Tie dyeing is wonderful artistic craft that began thousands of years ago. The two terms (tie and dye) naming the craft describe the process. Material is tied and then dyed to create hundreds of designs. While tie dye clothes became a staple in the hippie counterculture movement in the 1960s, the first record of people tie dyeing is around 2600 BC in China. The craft spread to India, Rome, and numerous other locations including South America over several millenniums. I find it interesting that the color purple was a favorite shade used during this period, and the color is still popular today. Current tie and dye practices were retooled in the 1960’s via modern dyes, specialized ties, rubber bands, and more precise quality control. While non-treated cotton clothing remains the staple for dyeing, other blends are used including silk and some rayon. While technology keeps changing, some items required in tie dyeing (such as cold water, warm water, hot water, squeeze bottles, soda ash, and a washing machine) never change. Tie dying became extremely popular during the 1960 rock era especially when rock legends such as Janis Joplin and Joe Cocker wore tie dye to concerts. Another interesting note is how each professional tie dye artist cannot tie dye every design. It appears each artist finds and enjoys a their niche of work. Today thousands of tie dye party and tie dye project efforts are taken on by individuals annually. The availability of a diy kit in craft stores has certainly aided the popularity of creating your own tie dye shirt patterns. We hope we have provided some education on tie dye patterns and our quality differences. Do you have comments, questions, or reviews? Feel free to call us at 770-254-6392 or use our contact form for much faster service. We need your suggestions and feedback. Your input will help us improve, so take a moment and send us your thoughts. If you need a bulk order or custom work, then send us an email. Satisfaction Your satisfaction is important. We provide a 30 day refund or exchange policy. Privacy Your personal information will never be shared. Security Our checkout pages are secure via a https connection. Pricing We offer higher quality longer lasting products at fair prices.